A lot of people are entering our New Holland “Down on the Farm” Classic iPod Keepsake Contest here at Commodity Classic. The FFA is helping out by selling Michael Peterson’s new CD, which you can only purchase from a New Holland dealer until later in the spring. 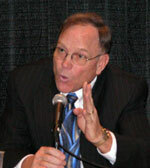 Also speaking out at the opening press conference was the ASA president, Bob Metz. Bob is proud of the progress being made with biodiesel and thinks that soybean growers need to get involved in the organization to make their voice heard. It’s a grassroots effort he says. That’s what’s going on here at policy issues are discussed and the membership provides guidance for the staff of the organization to work on in the coming year. The first press conference here at Commodity Classic is always with the leadership of NCGA and ASA. Next year that will include NAWG, but more on that later. 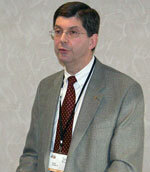 To get us started I interviewed NCGA President, Gerald Tumbleson. The first assignment I gave to my student bloggers was to cover this morning’s FFA Breakfast. 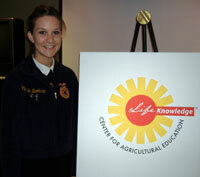 The breakfast was FFA’s venue to launch their LifeKnowledge Center for Agricultural Education. This Center is going to be the focal point for FFA’s leadership initiative that not only supports FFA’s core principles but also has the goal of establishing 10,000 quality agricultural science programs by the year 2015. The first media-centric event I got to participate in here at Commodity Classic was done by Bayer CropScience. It’s Commodity Classic week here on AgWired. That means you must enter our contest to win a video iPod, which is being sponsored by New Holland and watch for event coverage that includes student bloggers Mary Irelan and Margy Fischer, sponsored by Monsanto. This week’s ZimmCast is a little different. No one on one interview. You can hear some of the music from Michael Peterson’s new CD, “Down on the Farm” and I interviewed both Mary and Margy to find out what they want to accomplish at Classic and what they think about blogging it. Number two on the program today is Steve Paszkiewicz, Agronomy Research Scientist. Yesterday Harry sent in a segment from a talk radio show he frequently appears on. I thought you might enjoy it. Our final presentation of today here at the Pioneer event is being given by Thomas West, VP, Biotech Affairs & Business Support. It’s Thomas’ job to work on biotech regulatory acceptance around the world. I’m assuming this means he’s got some serious frequent flyer miles. After a short break this afternoon we got our virtual tour of the Pioneer Hawaii Research Station. Our presenters are Steven Lupkes, Coordinator and Cindy Goldstein, Outreach Manager. 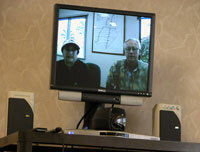 They are “online” with us on a two-way video/audio hookup. They’re talking about how and why they do research in Hawaii and the benefits and challenges it represents.